Vegetable's travels deepen mystery about timing of first contact between people in Americas and the South Pacific. The unassuming sweet potato (Ipomoea batatas) has been at the centre of a decades-long debate about when ancient peoples in the Americas and Polynesia first made contact. Now, a study1 finds that the vegetable, which is native to South America, beat people to the South Pacific islands by at least 100,000 years. Researchers originally set out to clear up the sweet potato’s evolutionary history. By pinpointing its closest living wild relative, the team hoped to help plant breeders increase crop yields and bolster the vegetable's resistance to threats such as pests and disease. But the scientists realized that their data could also establish when sweet potatoes arrived in the South Pacific. The work was published on 12 April in Current Biology. When Captain James Cook arrived in Polynesia in the eighteenth century on his journey of discovery, the vegetable was already ubiquitous in the region. The prevailing explanation is that Polynesian voyagers had sailed to South America and brought the sweet potato back to the islands on their return. Archaeological and genetic data seemed to support this conclusion, although scientists have questioned some of this evidence over the years. The sweet potato seemed to be a solid piece of evidence in support of pre-Columbian contact between Polynesians and South Americans, until now. The latest study suggests that it’s possible that sweet-potato seeds crossed the Pacific Ocean without help from humans. Previous research shows that the seeds will sprout even after exposure to seawater2. Birds also routinely cross the Pacific and could have spread the seeds3. “We hadn’t planned to study this anthropological question, but we realized we had the data to do so,” says Pablo Muñoz-Rodríguez, a botanist at the University of Oxford, UK, and an author of the study. He and his colleagues sequenced the genomes of sweet potatoes and 39 of their relatives. They identified Ipomoea trifida as the modern crop’s closest living wild relative. Among the 199 specimens used for the study was a sweet potato plant collected in 1769 by botanists Joseph Banks and Daniel Solander, members of Cook’s expedition to the Society Islands in French Polynesia. Muñoz-Rodríguez and his colleagues sequenced the genes from energy-producing structures called chloroplasts in the dried leaves of this nearly-250-year-old sample. They compared these sequences with the DNA of modern sweet potatoes from the Americas to estimate how long the island vegetables had been genetically isolated from their mainland brethren. 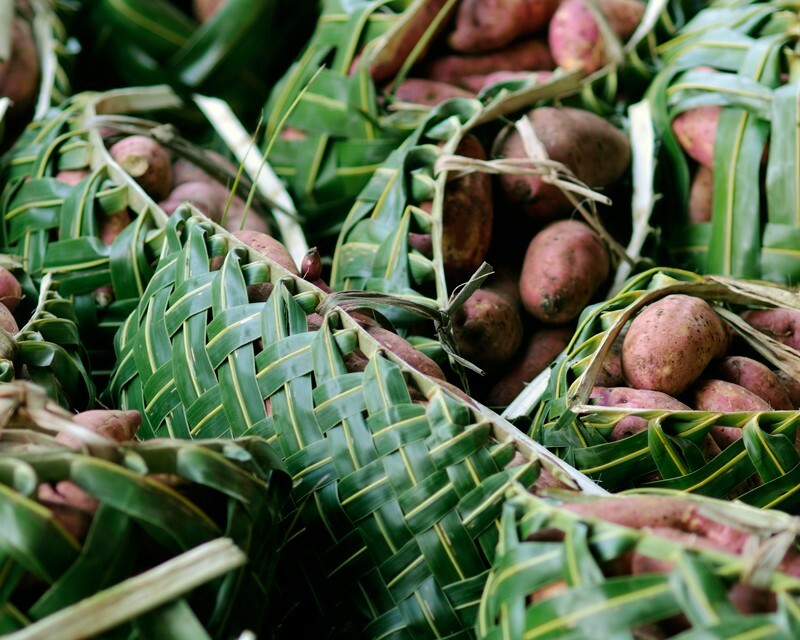 The team found that the two lineages split at least 100,000 years ago, indicating that the sweet potato was probably in Polynesia tens of thousands of years before people were. The findings are not without controversy: some researchers question the handling of the 250-year-old herbarium sample used to generate the 100,000-year divergence estimate. The team didn’t follow standard procedures for handling and analysing ancient DNA, says Lisa Matisoo-Smith, a molecular anthropologist at the University of Otago in Dunedin, New Zealand. Her work on ancient chicken DNA supports the idea of contact between Polynesians and Americans before Europeans arrived in the South Pacific. She questions some of the findings from Muñoz-Rodríguez and his colleagues given the age of the samples, and would like to see the tests replicated independently. But﻿ Robert Scotland, a study author and botanist at the University of Oxford, UK, argues that it isn’t standard practice to use ancient-DNA techniques on herbarium samples, since they tend to yield genetic material in good condition. Correction 20 April 2018: This story originally referred to the sweet potato as a tuber, which is incorrect. The text has been updated to address this. Muñoz-Rodríguez, P. et al. Curr. Biol. https://doi.org/10.1016/j.cub.2018.03.020 (2018). Miryeganeh, M. et al. PLoS ONE 9, e91836 (2014). Viana, D. S., Gangoso, L., Bouten, W. & Figuerola, J. Proc. R. Soc. B 283, 20152406 (2016).